How would you use the £1,000 you could save on Business Energy? Whatever the size of your company, we are so confident that we can reduce your business energy costs that we guarantee to save you at least £1,000. If not, we’ll pay you the difference that makes it up to £1,000* anyway. This is a huge amount for any business, and it can really make a difference to your bottom line. But how would you spend that £100 saving? We reckon it would be a good opportunity to treat your team, after all that's what makes your business tick, and a happy team is a hard working team. So, if you’ve recently switched business energy, or are considering it, here are some ways you can use the the money you save on your annual energy bills to treat your team members. It’s well-known that healthy workers are more productive, more focused and generally happier than those who aren’t - looking after the health of your staff helps to improve their physical and mental well-being, resulting in less sick days. Treating your staff to a weekly fruit delivery can cut down on the number on unhealthy snacks they eat, and improve their health. Fruit delivery companies such as Fruit2Office can deliver selections of fruit directly to your workplace, meaning you won't even have to make regualr trips to the greengrocer to help them with their five-a-day. Alternatively, why not help your team get their eight-glasses-a-day by providing them with a fresh water dispenser? Get a quote from Angel Springs (who keep UK Power HQ happily hydrated) and arrang a package to quench the thirst of your team. Everyone needs regualr breaks during working hours, but many of us, sadly, choose to eat lunch while at our desks, and a brew run is often the only time away manage to prise ourselves away from our computer screen. 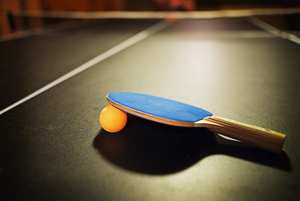 But it's important for both personal wellbeing and productivity that team members take adequate time away from their desks, and having something to tempt them away can be a massive help - a ping pong table can get employees on their feet and keep them entertained. You can pick up a ping pong table for around £200, or you might want to pick up something else to keep your team entertained – how about an air hockey table for £499.95? Afootball table for £389.97? Or even a pool table for £615? Whatever you treat your team to they’re sure to feel valued and happier as a result! We all know that work-life balance is important, but sometimes it’s good to mix the two. A team away day or evening out can really help your team bond away from the workplace and get to know each other on a more personable level. Whether you choose to spend you business energy savings on a team meal out, or a full days team building – it will be a worthwhile investment. ‘Escape Rooms’ are a big hit at the moment, and with quests popping up across the UK there’s sure to be an escape room near your workplace. They’re the perfect way for your team to bond while working together to solve clues. You can see a list of the best around the UK on Tripadvisor. These are just a few ways you could spend your business energy savings to treat your employees, let us know how you'd spend your savings. See how much we can save your business by checking out our business energy page and getting a quote today.